Is Australia's budget out of control? Many Australians have a gut feeling that Tony Abbott and his government are bad news for this country. His reply is that he has an unpopular job to do. He must "fix" the budget so Australia can live within its means. Even in defeat the LNP keeps talking about the debt problem which they say way created by Labor. The government and our subservient media have endlessly ranted about the need to cut, cut and cut even more from the budget. This gut feeling about the Abbott government is basically correct. There is no need for Australia to make the budget cuts enacted or proposed by the government. Australia does not need austerity to "save" the economy. The government would have us believe Australia is a poor country which does not have money for these "extras". In fact, Australia is a wealthy country which spends very little on welfare, age care, scientific research, etc. The best way to see this is to compare Australia's income and expenditure with that of other countries around the world. So why does the government want to make these cuts? The "Australia needs Austerity" mantra is "spin". It is merely a pretext for the Abbott government to lower the living standards of ordinary Australians, cut basic services like health and education, and remove vital support for people who need it most, such as the unemployed, the elderly, aborigines, and those with disabilities. The cuts Abbott has made will certainly make the lives of many people much worse. The government says they want to bring the budget into surplus. But they want to bring the budget into surplus without increasing taxes on the mining companies and without removing the methods the wealthy use to avoid taxes like putting money in superannuation or using negative gearing. They are happy to increase taxes on ordinary people, as in the increasing petrol tax, medibank surcharge, proposed increase in the GST and extending the GST to food. They hope to keep the tax burden on the wealthy as low as possible while cutting money which benefits ordinary people and increasing their taxes. How does Australia compare with other countries? In what follows I will show that Australia is one of the wealthiest countries in the world according to the standard measured of wealth, its GDP. Australia has the 12th largest GDP in the world. 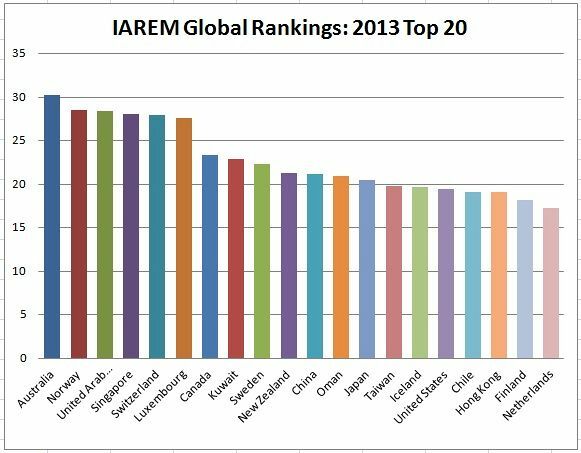 The countries just above us are Canada(11th), India(10th), Russia(9th), Italy(8th) and Brazil(7th). All countries with a GDP greater than Australia, with the exeption of Canada, have far larger populations. Australia's government debt is also one of the lowest in the industrailzed world. It is actually lower than any "western" country that has a higher GDP. Also, when compared to other countries, Australia spends far less on welfare and aged care than other wealthy European country. The claim that Australia is nearly broke is laughable in the light of information that is quite easy to find. It shows how little investigation our media carries out. They only repeat what the government and the big end of town wants us to hear. Australia has a disastrous level of debt? The GDP is used to measure the economic performance of a country. It measures the value added in production in that country. Of the 190 countries ranked in terms of their GDP, Australia is 12th. (1) Australia's per captia GDP, that is the GDP diveded by the population, is between 4th and 9th in the world, depending on which calculation is chosen. (2) Measured by GDP Australia has one of the best economies in the world. This is why we have been called the lucky country. The graph below shows the national debt as a percentage of the GDP for the countries in the Organization for Economic Cooperation and Development (OECD). The OECD is an international economic organization which has 34 members. 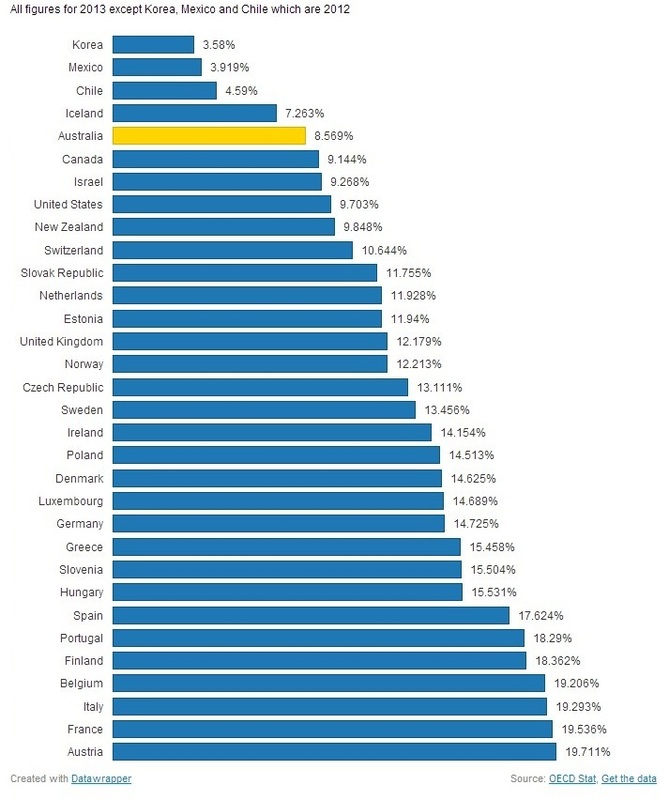 Most OECD members are high-income economies and are regarded as developed countries.Australia has the third lowest debt to GDP ratios in the OECD. So, not only does Australia have a good economy, it has a very low level of debt compared to the strength of the economy. Notice that Japan, Greece, Italy, Israel, the UK and the USA all have debt to GDP ratios higher than the OECD average. So who really has a debt problem? Not Australia! 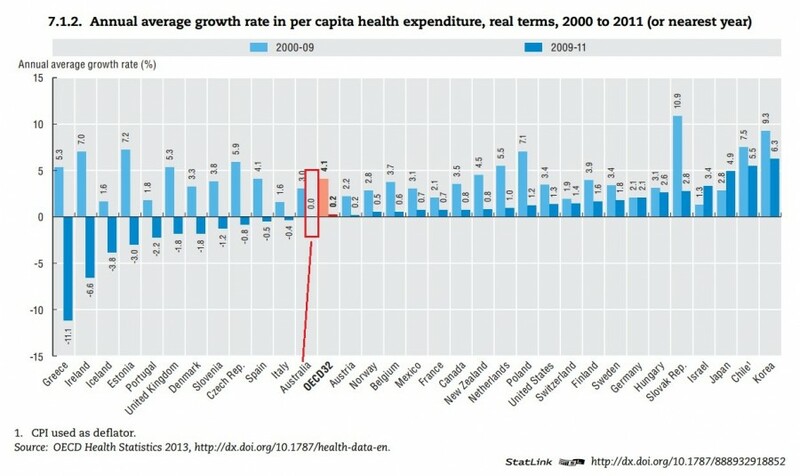 We have one of the healthiest economies in the world. There is no need for the "heavy lifting" demanded by Joe Hockey. 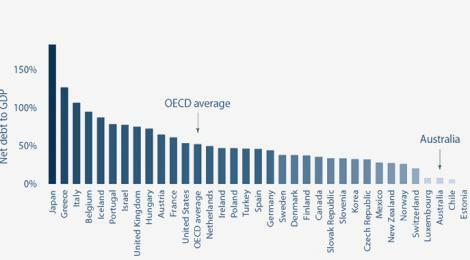 Australian debt compared to OECD average. The following graph shows a comparison between the average OECD debt to GDP ratio and the ratio for Australia from 1983 to 2009. The two ratios can be seen to move up and down together, however the Australian ratio is usually about 30% lower than the OECD average. It has been consistently low and isn’t spiralling out of control. The graph only goes up to 2009. Australia’s debt has increased since 2010 from about 11% to 11.7%. But during the same period, the OECD average has increased to around 70%! While Joe Hockey and the usual economic pundits must know this, they still say our level of debt demands immediate and drastic surgery. They keep to the "offical story" even though the facts tell a very different story. Can the US afford to pay its debts? If you want a reality check on debt to GDP ratios, consider this graph of the debt to GDP ratio of the United States from 2006 to 2014. (3) The debt to GDP ratio is 100%! This means that their ratio is about 50 times higher than Australia's. I repeat: Who really has a debt problem? Not Australia! Two other measures of the Australian economy. Australia's Gross National Income (GNI) per capita is also well above the OECD average. The GNI measures the total income from production and services, by Australians, here at home or abroad, and discounts income from foreign-owned companies operating in Australia (e.g. 83% of our mining industry). It shows that Australia's GNI has been greater than the OECD average since 2008 and is rising faster that the OECD average GNI. In fact, Independent Australia ranks our economy as the best in the world. Another important part of the Abbott/Hockey austerity scam are the subtile hints that Australia is overly generous with its "social contract" benefits, described as the safety net or the social wage paid out in health and pensions. We spend about 8.5% of our GDP on welfare, which is less than all but 4 countries in the OECD. The following graph shows the welfare benefits paid out by the different countries as a percentage of their GDP. 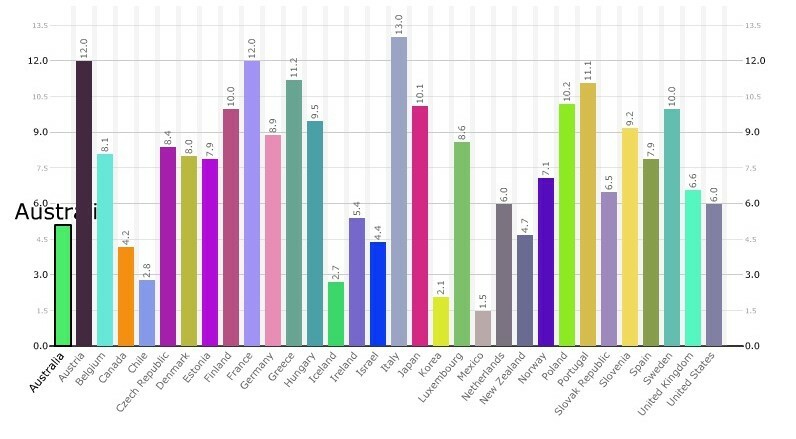 Such economic powerhouses as Ireland, Poland, Denmark and Luxembourg pay more than 14%. Far from being overly generous, Australia is rather penny-pinching when it comes to welfare. Still this does not stop the media and the Liberal/Nationals from ranting about it day and night. The same point can be seen in the following chart. It shows Australia's public spending on welfare since 1990, compared to the OECD average as well as France, Japan and the US. We are at the bottom along with Japan and the US. And the Abbott/Hockey austerity drive will only push us lower! Is Australia's age pension too generous? The following chart shows the public money spent on old age pensions for the OECD countries. Only 7 OECD countries spend less than us on pensioners. This is for 2010 and covers the total social expenditure, not just cash benefits paid to pensioners. We are spending more than Mexico, Korea, Iceland or Chile. Wow! Is it a surprise that we have more people over 65 living in poverty than almost all OECD countries. The 2011 OECD Report PENSIONS AT A GLANCE 2011: RETIREMENT-INCOME SYSTEMS IN OECD AND G20 COUNTRIES gives the old age and poverty rates of 30 countries. (4) They show the poverty rates for people over 65, where poverty is measured in terms of an income less than 50% of median household disposable income. Australia's poverty rate for people over 65 is 26.9%. Out the the thirty countries, only three have higher rates of aged poverty than Australia: Mexico wit 28%, Ireland with 30.6% and Korea 45.1%. The OECD average is 13.5%. Do we spend too much on healthcare? 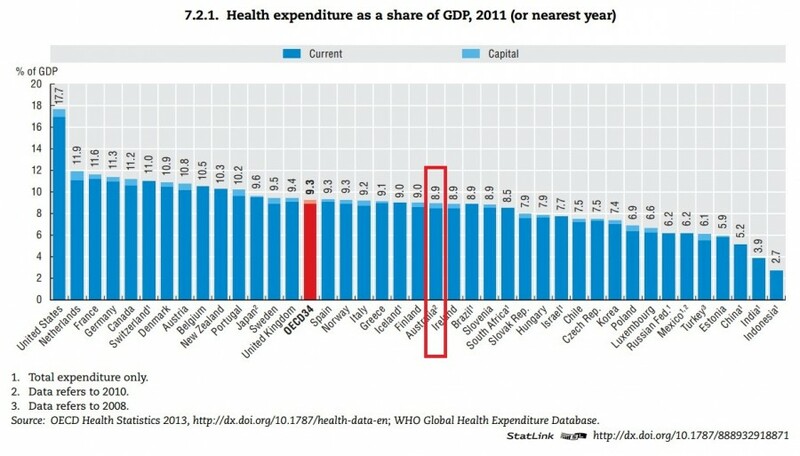 Although we spend slightly more per capita on healthcare than OECD average, we spend less than the OECD average as a share of GDP. Is the cost of health care exploding? A look at the important facts about the Australian economy shows that if anything, our economy would benefit from increases in spending in the areas cut by the Abbott government. Besides welfare, Australia can afford to spend more on healthcare, education, industry support, scientific research, as well as foster new techology and support the arts. Why is this a problem? My conclusion is that the Abbott government, like many before it, assumes that their job is to "manage" the Australian economy for the big multinatinal companies and prospective overseas investors. It is clear that their interests are catered for. Their wishes are put regularly to both sides of politics. The rest of us just don't come into the picture. Nothing will change in Australia until people realize that their interests are almost completely ignored by the Austraian political elite. (5) This any many other charts used in the article come from the excellent article by Glenn Murray: http://www.glennmurray.com.au/abbotts-war-on-the-rest-of-us-and-why-theres-no-need/.